Make-up books are like beauty bibles for me. I read them, study the photos, read them again and practice the tips and techniques that line the glossy pages of these instructional glamour guides. 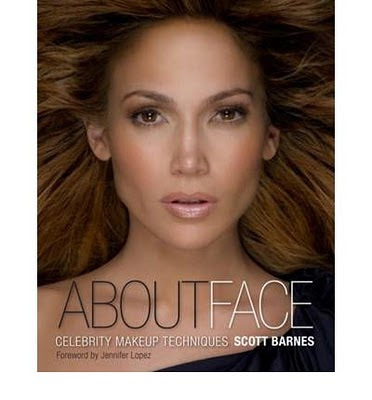 Recently one of my favorite make-up artists, also a favorite of Jennifer Lopez, Scott Barnes released a new make-up book titled About Face. He is the artist responsible for the J-Lo glow and in his new book he shares all his secrets. I was surprised at how detailed he was on all his transformations. Usually artist are explain their techniques like this.... "I put on some concealer using a brush, the models skin was so perfect I didn't need foundation, then I applied a pink blush and finished off the look with a berry lipstick using my fingers." They make it sound so simple when clearly they have used three different shades of blush, a lip liner and more like a whole bottle of foundation and powder! Every time I finish reading a make-up application explanation like that I am like "oh wow thank you soooo much for sharing all your deep knowledge of beauty secrets with us. NOT!" Well this is not the case with Scott. He graciously offers easy to understand clear instructions regarding his application including what kind of hair his brushes are made of and creates some truly stunning very wearable looks. My only complaint about the book is the extreme use of retouching in the "after" photos. The photos themselves are beautiful, but in my opinion they are just too heavily airbrushed. The poor girls look like claymation puppets or drag queens with all of their 3D reality stripped from there beautiful faces. If you can look past some over used photoshop then this book will improve anyones make-up skills. If you want to learn more about the art of make-up application and can look past some over use of photoshop then About Face will definitely improve your make-up skills. Scott also has some great tutorials on his website www.scottbarnes.com.